The world is vast and filled with billions of our fellow humans, all of whom are experiencing the spinning of this planet through the lens of their own existence—through the stories they tell themselves about the world. Consider this: we tell ourselves stories all the time about how different we are from the people in other nations. With Blue Planet’s focus on creative international projects that unite students across borders, we aim to change the stories that we hear and absorb and believe about each other. Our students educate and enlighten each other by telling their own stories about the places they live, the cultures they inhabit. They also make up stories—about imaginary lands, new constellations, monsters and angels and ordinary kids. They tell these stories to each other through creative writing–and also through art or drama or dance. And as these stories come together in a beautiful collaborative project, the children of two cultures come together, too. Borders disappear like train smoke. The world becomes a little smaller and a lot friendlier. The stories our students tell themselves about the world become positive and exciting. Not scary and forbidding. It’s our hope, and our belief, that this process, this creative exchange of stories across borders and cultures, will change the world. In a small way, perhaps…but in a small positive way. That’s our story. We’d love for you to be part of it. Explore our site and see what kind of amazing things we can do together. Let us design and lead a creative international writing and arts project with your students and their peers in another country. Our annual summer weekend filled with hands-on workshops, museum visits, and more, The latest in global education, led by experts from around the world. Our dynamic professional development workshops inspire teachers to bring creativity and global awareness into their classrooms. 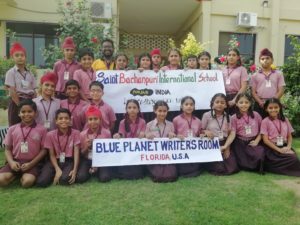 The mission of Blue Planet Writers’ Room is to lead groups of students from different countries in creative international projects. Our Writers’ Room spans the globe, and in this virtual space between cultures, we strive to help students develop their skills in creativity, global awareness, and the making and sharing of stories. We seek to increase their tolerance and celebration of diversity, to involve them in the advancement of international cooperation, and to help them realize that despite our differences, we are all connected, creative, and human. 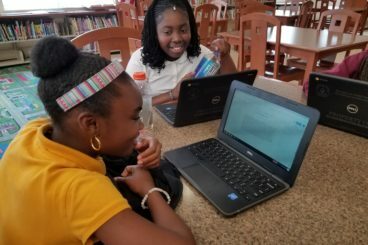 At Blue Planet, we use technology to connect groups of local students with groups of students in other countries to engage in story exchanges about their lives and cultures. Teaching Writers and Teaching Artists lead the students in workshops where creative writing and the arts are used to establish common ground that lets the students communicate with and learn about each other across cultural and geographic borders. "As a public school, we are tasked with the great responsibility of preparing all students to be the citizens of tomorrow. Blue Planet's work has been a key element in that effort with a focus and emphasis on empathy and developing a respect for others across time zones, politics, and languages." "[T]he Foundation is primarily focused on supporting programs that increase the availability of arts-access programs, particularly programs designed to expose children and youth to the arts and increase their appreciation for the cultural world, and that increase access to programs designed to encourage children and youth to explore their individual creativity. 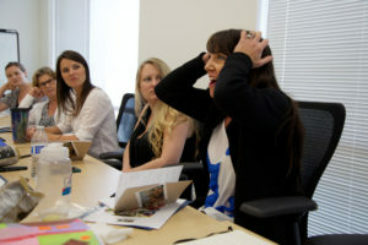 Blue Planet Writers' Room's Story Ambassadors program is a shining example of that type of programming." "Students have developed a love for writing and are very proud to be in this [afterschool writing] club. The students' assessment of the project was very positive and included such comments as "It's fun and helps me write better!" Others have asked, "How can I join the Blue Planet Writers' Club?" It is without hesitation that I offer my support to this creative and fun writing project. I am appreciative that this opportunity has been afforded to our students." What a great collaboration this was! Our Chinese teachers were really touched that we focused on their culture in such a unique way, and that we shared it with American students. The parents of my kids are all abuzz too--one said about this project, "This is what school should be like!" So again, thanks for another amazing opportunity that just wouldn't happen without Blue Planet. I could never develop or coordinate such an effort on my own, and am so grateful that you all make this happen. It enriches my teaching, takes me out of my comfort zone (in a really good way), inspires my kids, and taps into my passions. You guys rock! Looking forward to more collaborations in the future! "I am honored to have had the opportunity to work with Blue Planet Writers' Room. Susan Gay Hyatt and Cora Bresciano are two of the best educators I have ever had the privilege of working with. They turned my Digital Connector class into a work of art. They brought the best out of each of my students. They made my students into writers and poets and sparked their imaginations. Their talent is amazing! They were able to get my class of technical students (geeks) engaged in writing, not just on the surface, but deep down in hearts and minds. In today's world of average and substandard teachers and programs, Blue Planet represents what education should be! They inspired my students to do more, to learn more about writing, and to learn more about themselves though writing. As I stated in a meeting of afterschool program administrators, "you are a fool if you are not using Blue Planet Writers' Room in your programs!" They are simply the best. They are exceptional educators, with great teaching and writing methods, and they will get the best out of each and every one of your students." 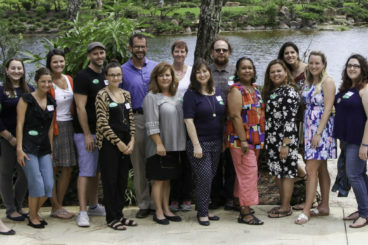 "Every moment of the Summer Institute was engaging and incredibly inspirational. I could hardly write fast enough to keep up with all the ideas each presenter was sparking in me. I've come away with new tools as a teacher and as an artist--tools I can't wait to incorporate into my classroom." "Carve out space in your summer and attend Blue Planet's Summer Institute. Whether you're a novice or a veteran in your discipline, the work that's done during the Institute will profoundly impact your practice. Equally, the people you'll meet and learn with will become a valuable professional network."